An unscheduled spacewalk is being prepared by International Space Station Crew Members Scott Kelly and Tim Kopra with great urgency aboard the orbiting laboratory to be ready to head outside as early as Monday to recover the Space Station’s Mobile Transporter that got stuck in a position between work sites Wednesday night. ISS Engineering and Management Teams on the ground are also extremely busy working through the development of EVA procedures and a go-forward plan on whether to press ahead with the EVA on Monday or allow another day for preparations. The urgency arises from the upcoming launch and docking of the Progress MS spacecraft set for liftoff on Monday for a two-day rendezvous with ISS. Because ISS has to conduct re-orientation maneuvers for the arrival of the Progress, the Mobile Transporter can not be in an unsecured configuration – requiring the EVA to be performed on Monday or Tuesday. The Mobile Transporter is a critical part of the Space Station’s Mobile Servicing System that includes a number of components such as the Dextre robot, the Station’s external handyman, and Canadarm2 that has been a critical part of ISS assembly, spacewalk support and the grapple and release of visiting vehicles. The Mobile Transporter was delivered to ISS along with the S0 truss on Space Shuttle Mission STS-110 in the spring of 2002. 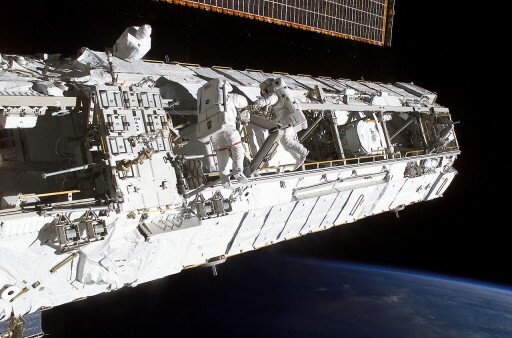 It rides on rails and is capable of moving 108 meters along the Space Station’s Truss. Installed atop the MT is the Mobile Base System MBS which provides Power & Data Grapple Fixtures (PDGF) for the robotic arm so that it can be moved to any position along the long truss segment when riding the transporter. The MBS gives the Station’s robots the ability to relocate to any portion of the Station where and when they are needed. Four grapple fixtures are hosted by the MBS for attachment of Canadarm2, Dextre or any payloads compatible with the PDGF. Also, MBS has a pair of Payload/Orbital Replacement Unit Accommodations (POA) that are similar in architecture to the Latching End Effectors of the robotic arm to hold payloads in place. 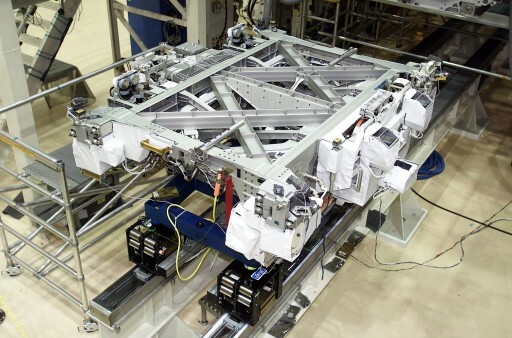 Reaching a top speed of 1.5 meters per minute, the Mobile Transporter can transition between ten work sites along the truss where it can be secured and locked down to provide a stable platform for robotic motion and spacewalk operations. The MBS is 5.7 by 4.5 by 2.9 meters in size with a total mass of 1,450 Kilograms without any external equipment using a structure made of aluminum and titanium for extra strength. When Dextre and Canadarm2 are attached to the Mobile Base System, the combined complex has a mass of 5,000 Kilograms. In total, there are over 20 motors on the MT for translation across the truss and for latching the system down at the work sites. Magnetic indicators are used at the work sites to provide feedback to the MT where to latch down to reach a precisely known position needed for the simulation and preparation of robotic activities. The Mobile Transporter was on the move again Wednesday night – departing Work Site 4 where it was stationed for an extended stay to be moved to WS2. The Translation Drive (TD) Integrated Motor Controller Assembly (IMCA)-A experienced a fault very shortly after leaving WS4 and the motors were automatically commanded to stop. 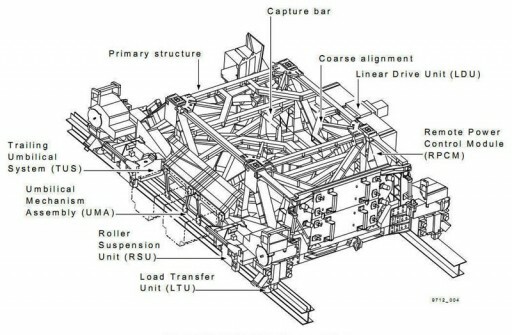 Another error was experienced when the MT was commanded to retreat to WS4, meaning that it was essentially stuck between WS4 and 2, just about ten centimeters from its latching position at WS4 located on the central portion of the Station’s truss structure. Robotics specialists began troubleshooting the system by making several attempts in different configurations to move the MT back to WS4. 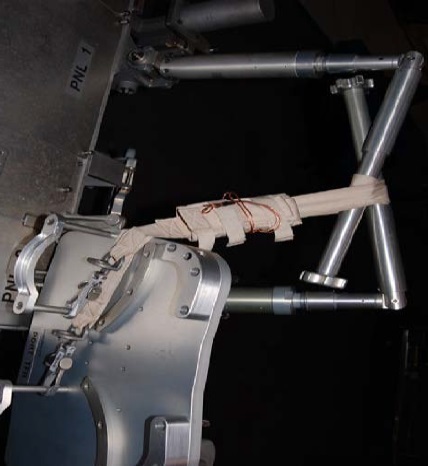 With no success, the MT was powered down and the Mobile Servicing System was configured to be powered via its Keep Alive Power Supply using the MTRA – installed in a spacewalk just over a year ago. The MTRA is the Mobile Transporter Relay Assembly, essentially a power box coming with four cables to deliver backup power to the MT systems should it get stranded in between Work Sites. The current configuration of the Mobile Transporter is “braked but not latched” in which only certain Station operations are permitted to avoid inadvertent movement of the MT. Surveys using external cameras were performed and found the likely culprit as it is currently believed that the starboard CETA Cart has one of its brake handles engaged. Aboard ISS there are two CETA carts known under their full name ‘crew equipment and translation aid.’ They are coupled to the Mobile Transporter to translate along the truss to various worksites to move equipment or even spacewalking crew members between locations. 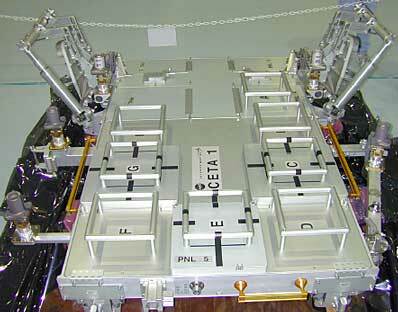 One of the CETA carts is located on the starboard and one on the port side of the Mobile Transporter, using the same rail system. When needed, the carts can be detached from the Mobile Transporter and moved by spacewalkers to handle larger equipment. When not in use, the carts are attached to the Mobile Transporter and ride along with it. Each CETA cart, using an aluminum structural frame, measures 2.5 by 2.35 by 0.89 meters in size with a total mass of 283 Kilograms. There are four brake handles on each CETA cart – two Parking Brake Handles on the port and starboard side of the cart, and two Dynamic Brake Handles, also on either side of the cart. A smaller Parking Brake Release Handle can be used to release the Parking Brake for motion. When attached to the Mobile Transporter, all CETA brake handles are disengaged. The current thinking is that one of these four handles got engaged, but there is also the more remote possibility that one of the four Wheel-Brake Assemblies on the cart seized u, preventing motion despite disengaged brakes. It has to be noted that the brake handles of the starboard CETA Cart were recently operated by Scott Kelly during U.S. EVA-33 in November. He was tasked with tying down the brake handles in an effort to fix them in position and ensure they would remain clear of any work sites and remain in a disengaged position. Kelly also removed the CETA Cart Coupler and swingarm. 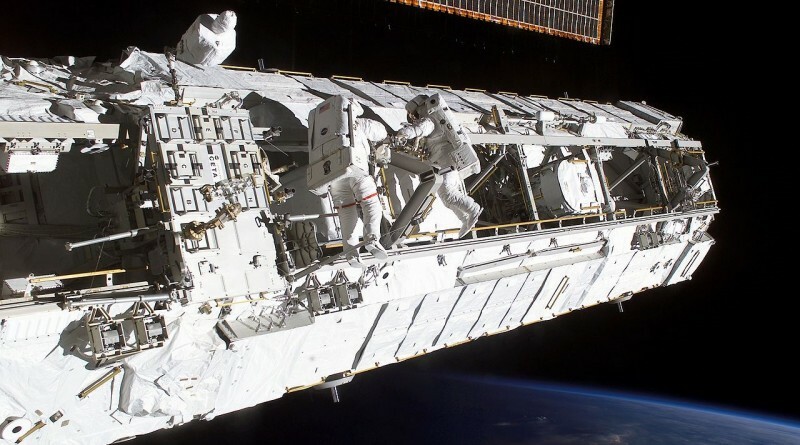 According to the publicly available ISS Status Reports, the Mobile Transporter had not been moved since the EVA until Wednesday, suggesting the possibility that the CETA cart brakes were engaged in the process of the spacewalk. With the Mobile Transporter in its current configuration, it is not considered safe to put ISS through the maneuvering required for the upcoming arrival of the Progress MS spacecraft. A decision was made on Friday to press into preparations for an unscheduled contingency EVA either on Monday or Tuesday to reconfigure the Mobile Transporter and CETA cart for the upcoming Progress arrival on Wednesday. For the undocking of Progress M-28M on Saturday, the MT is in a favorable position and analysis is continuing whether this position would also be stable enough for the Progress arrival. 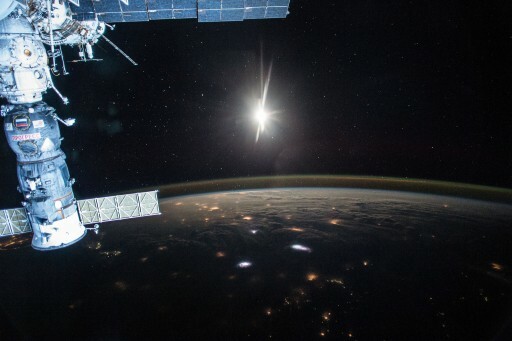 A final decision will be made by the Space Station Mission Management Team on Sunday. 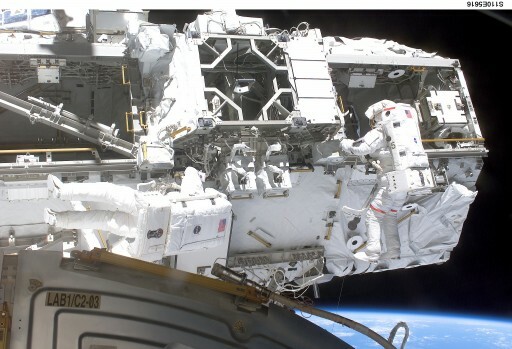 If the MMT decides to press ahead with the spacewalk, Scott Kelly and Tim Kopra would venture out of the Quest airlock on Monday or Tuesday depending on the timeline set for the EVA preparation. Scott Kelly can look back at two career EVAs performed in October and November with Kjell Lindgren while Tim Kopra has the advantage of having just launched, coming out of ISS and EVA training. He conducted one spacewalk back on his first flight to space in 2009. The spacewalk would last approximately three to three and a half hours and see the crew members translating over to the CETA cart and surveying its brake handles before making the necessary reconfigurations to transition the Mobile Transporter back to an operational state. Most likely, robotics controllers will check out the motion of the MT while the crew is still outside to ensure it can be moved to a safe locked position. Progress MS, the first in a line of upgraded Progress resupply craft, has been installed on its Soyuz 2-1A launch vehicle on Friday and is set for rollout to its Baikonur launch pad on Saturday. Liftoff is planed at 8:44 UTC on Monday to send the spacecraft on a two-day rendezvous dedicated to checkouts of the newly introduced systems before the craft will be inbound for an automated docking to the Pirs module, expected at 10:31 UTC on Wednesday.